Took a break from the festivities to share this snippet of exciting news. 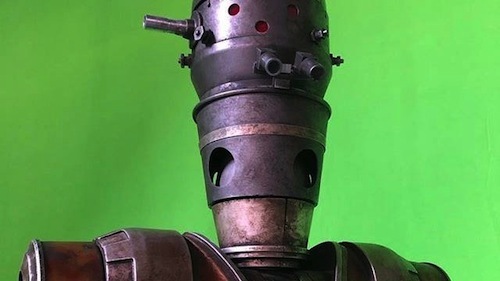 On Christmas Day, director Jon Favreau took to Instagram and posted a photo of what appears to be IG-88 in the upcoming Disney+ Star Wars live-action series The Mandalorian! IG-88, commonly referred to as 'Phlutdroid' by fans, was a popular bounty hunter from Star Wars: The Empire Strikes and the action figure had pride of place alongside Boba Fett, Dengar, Bossk, Zuckuss and 4-LOM. The Mandalorian is expected to debut, exclusively on Disney+, in late 2019. Stranger Things season 3 won't be streaming until next summer. 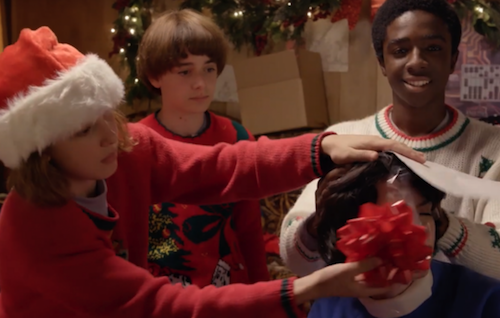 However, Netflix has some holiday cheer from the Upside Down as the gang from Indiana wrap gifts. Millie Bobby Brown, Finn Wolfhard, Noah Schnapp, Caleb Mclaughlin, Gaten Matarazzo and Sadie Sink all feature. Aside from the return of Stranger Things, there's much to look forward to in the geek galaxy in 2019. Game of Thrones' final season airs in April. Disney is set to dominate the box office with Captain Marvel, Avengers: Endgame, Toy Story 4, Frozen 2 and Star Wars: Episode IX, and streaming services with the launch of Disney+. May I take this opportunity to wish you Happy Holidays! 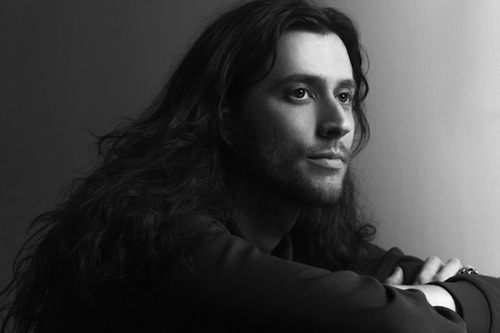 Lucasfilm announced on Wednesday that Ludwig Göransson, the acclaimed composer of Marvel Studios' Black Panther, will write the score for The Mandalorian, the live-action Disney+ Star Wars series. 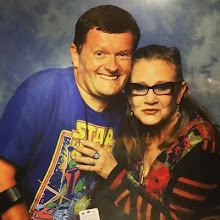 "Words fail to express how surreal and humbling it feels to be invited into the Star Wars universe," Göransson said. "I am deeply grateful to Jon Favreau and Disney for this opportunity and to John Williams for raising the bar so high with his iconic, intrepid scores -- they will never be matched. In these next months I hope to honor the tradition of Star Wars’ musical landscape while propelling The Mandalorian into new and unchartered territory. And I will try to remember that there is no try." The Mandalorian will be released on Disney’s upcoming streaming service, Disney+, in late 2019. It is written and executive produced by Jon Favreau (Iron Man). 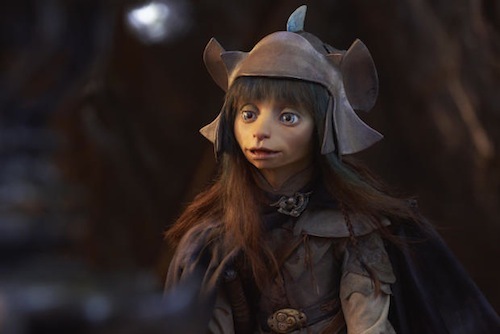 Netflix has released new images and announced an all-star cast from film and television for the streaming service's upcoming Dark Crystal prequel. The Dark Crystal: Age of Resistance. In a statement, Netflix said: "The Dark Crystal: Age of Resistance tells a new epic story, set many years before the events of the movie, and realized using classic puppetry with cutting-edge visual effects. The world of Thra is dying. The Crystal of Truth is at the heart of Thra, a source of untold power. But it is damaged, corrupted by the evil Skeksis, and a sickness spreads across the land. When three Gelfling uncover the horrific truth behind the power of the Skeksis, an adventure unfolds as the fires of rebellion are lit and an epic battle for the planet begins." The all-star cast includes Mark Hamill (Star Wars), Helen Bonham-Carter (The King's Speech) and Alicia Vikander (Ex Machina). Lisa Henson, CEO of The Jim Henson Company and daughter of Jim Henson, said in a statement, "It is thrilling to see this assembled team of artists, puppeteers and now voice actors, many inspired by my father's original film, work together to realize this unique world – through performance and craft – at a scale that is rarely seen today." Pedro Pascal will play the titular character in Jon Favreau's upcoming Disney+ Star Wars live-action series The Mandalorian. Pascal will be joined by an all-star cast including Nick Nolte, Carl Weathers, Giancarlo Esposito, Werner Herzog, Emily Swallow and Omid Abtahi. “We’re having a great time working with this incredibly talented group and excited for everyone to see what we’re up to,” says Executive Producer Jon Favreau. Dave Filoni (Star Wars Rebels) will direct the first episode. The Mandalorian is set between Return of the Jedi and The Force Awakens and will stream exclusively on Disney+ in late 2019. 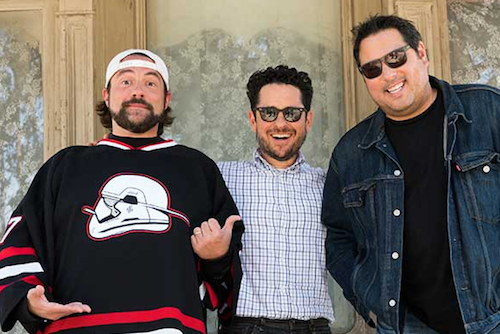 Director Kevin Smith (Chasing Amy) recently visited the set of JJ Abrams' Star Wars: Episode IX, currently in production at Pinewood Studios, and talked to Good Morning America (GMA) about the experience. Smith's unalloyed enthusiasm is infectious. Star Wars: Episode IX will be in cinemas December 2019. When a Bumblebee spin-off was originally announced many fans (myself included) baulked at the idea of another tired Transformers movie! Director Michael Bay had gone from a fun Steven Spielberg-produced rollercoaster ride with a heart to a cold, confusing, mechanical mess spanning 5 increasingly overblown instalments. However, director Travis Knight’s (Kubo and the Two Strings) soft reboot returns to the fabled Generation 1 (G1) source: an era rich in nostalgia, lore and synonymous with timeless Spielbergian suburbia. The eighties, where Knight and this fellow Transformers fan came of age. It's 1987 when Rick Astley was number one in the charts and Michael Jackson followed up Thriller with Bad. Now, as someone who is averse to spoiling things, the opening of Bumblebee evoked the sense of wonder this lifelong Star Wars fan had when seeing JJ Abrams' The Force Awakens in 2015. It's a mission statement that will transport fans back to the original animated series, movie and the hallowed pages of Marvel's weekly comic in a way Bay has failed miserably to do since 2007. 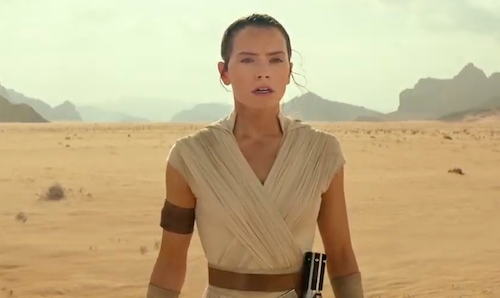 2019 is a big year for Lucasfilm's Star Wars franchise. Director Jon Favreau's The Mandalorian is the first live-action series, available exclusively on Disney+, JJ Abrams' Episode IX concludes the Skywalker saga, and Star Wars: Galaxy's Edge opens at Disney Parks. 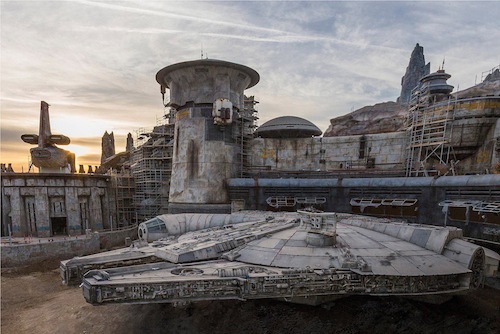 Disney Parks has shared the first official image from Star Wars: Galaxy's Edge featuring the Millennium Falcon, as seen in The Force Awakens and The Last Jedi, and Black Spire Spaceport. "Grab your Co-Pilot, and prepare for landing. Behind-the-scenes look at development on Star Wars: Galaxy’s Edge – coming to Disneyland summer 2019, Walt Disney World fall 2019." Does this excite you even more for Star Wars: Galaxy’s Edge? Let me know in the comments below. Marvel Studios has followed up a new trailer for Captain Marvel with a title announcement and trailer for Avengers: Endgame, the Russo brothers' highly-anticipated sequel to Avengers: Infinity War. 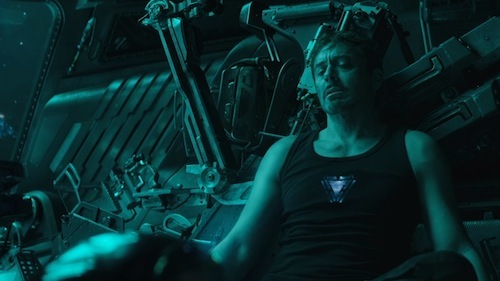 Avengers: Endgame is the climactic conclusion to a decade-spanning story. If rumours are to be believed, it'll see time travel, the multiverse ushering in Deadpool and the X-Men, and the journey's end of beloved heroes as they attempt to undo Thanos' snap. The next instalment will be in cinemas April 2019. Christmas is jammed full with its little traditions that permeate so many areas of our lives and go far beyond the putting up of trees, decorations or exchanging of gifts. It’s not all about guzzling down copious amounts of alcohol, mince pies or sprouts either (okay, well, maybe it is). But Christmas can also be a time for reflection, too. We are often looking back to the magical happy holidays of the past, especially when it comes to the television, films and music we consume…. Suddenly, regular Satellite channels offer Christmas themed programming 24-7. Whilst, the likes of Netflix cram a yuletide playlist full of treats that we all love to see time and time again, as the holidays draw near. Whether it’s an ‘Only Fools’, ‘Morecambe and Wise’, ‘Elf’ or ‘Home Alone’, we all have our favourites, that can often hark back to our childhood. One programme is often talked about on social media, sometimes even as early as November! This is when many begin their yearly episodic watch of a classic BBC children’s six-part series from the mid-1980s. 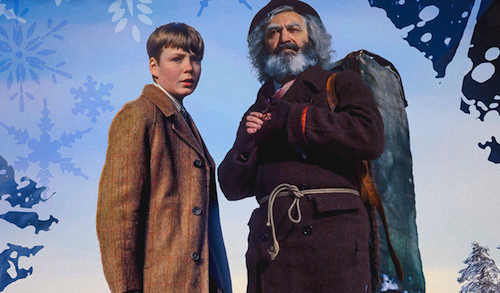 The Box of Delights is an adaptation of the book by the once Poet Laureate, John Masefield and it is a charming children’s fantasy adventure positively brimming with an old school Christmas feel from start to finish. Our plucky young hero Kay Harker (Devin Stanfield) returns home for the holidays. En route meets an old Punch and Judy man, Cole Hawlings, played by ex-Doctor Who Patrick Troughton. Hawlings entrusts Kay with his magical box of delights, as he tries to keep it from the clutches of the evil Abner Brown (played with theatrical aplomb and relish by Sir Robert Stephens). Kay’s fantastical adventures with the mystical box is an utter joy. The music used in The Box of Delights underpins the story perfectly, with its atmospheric Christmas themed soundtrack, combining sounds which echo so many other magical children’s dramas of the past. This is because the music is provided by none other than Roger Limb of the BBC Radiophonic Workshop. His work as an electronic musician has included stories for Doctor Who in the 1980s, as well as many other children’s dramas, like ‘The December Rose’, ‘Aliens In The Family’ and the stories found in the children’s programme ‘Look And Read’, as part of the Schools and Colleges strand. This soundtrack has now finally been made available to buy via Silva Screen records, under the guiding hand of fellow Radiophonic composer Mark Ayres, who has remastered it for this wonderful release. The 50-track CD also contains Richard Harvey’s ‘Christmas Day In The Morning’ (a synthesised re-working of ‘I Saw Three Ships’). This music accompanied the dancing children at a special Christmas party hosted by the Bishop of Tatchester within the story. The collection also contains an eight-minute segment of Victor Hely-Hutchinson’s ‘Carol Symphony’, performed by the Pro-Arte Orchestra. Its version of ‘The First Nowell’ is used as the theme tune and has become somewhat synonymous with The Box of Delights, being first used for its earlier radio adaptations too. 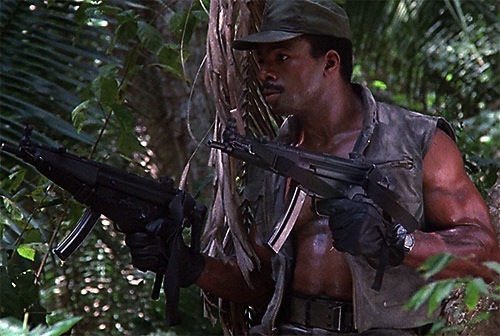 The piece was issued as a theme tune by BBC Records on vinyl in 1984, but here the actual televised opening and closing themes are presented for the very first time. The original piece by the Pro-Arte Orchestra is finished with additional electronic notes, which eases us into the soundtrack for the story. This CD has many highlights and from ‘The Time That Likings Are Made’ onwards, we are wistfully transported into the fantasy of the story. Beautiful harp-like sounds not only rekindle the identifiable motifs from the theme tune continually throughout, but they also underpin the music in pieces like ‘A Mountain In Switzerland’, which accompanies Cole Hawlings enchanted departure from Kay’s house with the ingenious use of a painting on the wall. They also appear in the early parts of the track ‘King Arthur's Camp’. This piece nicely builds using medieval like percussion, which highlights Kay’s urgent attempts to escape the wolves and his journey back in time, where he fights them off with the use of a broadsword. The piece ‘The Box Of Delights’ combines atmospheric electronic soundscapes which provide a mystical feel to the magic used by Hawlings. The music swirls as Kay whooshes into the night sky, escaping the danger of the wolves by using the box to go swift. The more traditional brass sounds in ‘Towards Dawn’ herald the start of a new day as Kay and Peter wade through waist-high snow, where they witness Cole’s kidnap by Abner’s evil henchmen. Then, the later ‘Snowman’ provides a small fun lighter respite, as the children build a snowman before it then descends into a snowball fight. ‘Herne The Hunter’ takes us on Kay’s journey into the Box itself and his meeting with this mythical character. Horns and the drumming of hooves sound as the two become animated Stags in the wood, whilst a more uplifting electronic tune accompanies their second change into flying ducks. Finally, the ambient and echoing electronic water sounds follow them as they become fish in the river, whilst all the time being pursued by the wolves. The upbeat jaunty synths contained in ‘Go Swift’, ‘In The Darkest Cellars Underneath’ and ‘The Spider In The Web’ have a familiar similarity to some of Roger’s work on the early part of the Peter Davison era of Doctor Who. Whilst the darker edged themes found in pieces like ‘Dreams’ and ‘Sweet Dreams’ may remind many of the fifth Doctor’s swan song and the sixth Doctor’s battle with Daleks in the creepy crypts of Necros. Kay’s trip back into the past once again beautifully blends the more orchestrated feel with an ethereal almost Jean Michel-Jarre like synths, as Kay is magically pushed along the animated sea to the island to find Arnold of Todi. ‘Under My Hand’ and ‘Slave Of The Night’ both offer yet more unnerving synthesised atmospherics to eerie animated creatures of the night, as Abner’s plan is put into play and the climax of the story is fast approaching. Things are then brought to a close as we go full circle with ‘Home For The Holidays’. For those interested in soundtracks, especially fans of electronic and radiophonic work will find lots here to enjoy. Similarly, the music has now, certainly for me, become as iconic as the adaptation itself. It simply is Christmas and it is both beautiful, very characterful and brimming with those little yuletide moments that send shivers down your spine. The CD is released on the 14th of December and is available to pre-order at all normal sites, as well as directly from Silva Screen. Go take this literal musical box of delights home with you this Christmas. You can pre-order The Box of Delights OST from Amazon.co.uk (affiliate link). 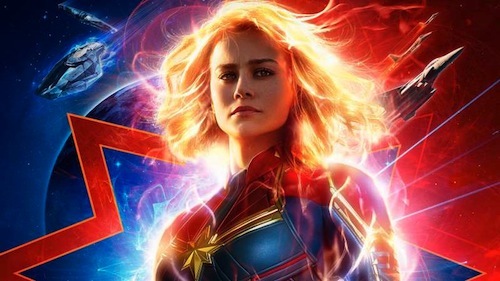 Marvel Studios will drop a new trailer for Captain Marvel during halftime on ESPN's Monday Night Football clash between the Washington Redskins and Philadelphia Eagles. Expect the trailer to appear online and here shortly thereafter. 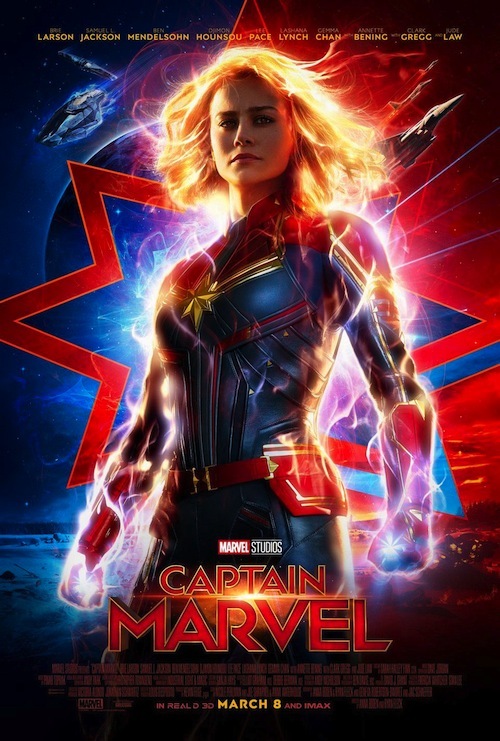 Captain Marvel (Brie Larson) is channelling DC Comics' Supergirl in a new poster to coincide with the trailer. Despite the monumental success of the MCU, this is the first superhero spin-off fronted by a female character. Warner Bros. beat Disney to the punch with the blockbusting Wonder Woman starring genre favourite Gal Gadot as the titular heroine. This holiday season is busy for Marvel Studios with a teaser trailer for Avengers 4, that sees Captain Marvel purportedly in a pivotal role in the aftermath of Thanos' snap, expected later this week or before year's end.